Today's lesson focuses on the scriptures surrounding Christ's birth and the little we know of his youth. We have probably just put away all of the Christmas decorations but I like the idea of revisiting the Christmas spirit just at that point in the New Year when we may have forgotten it. The following video has the 3 members of the First Presidency of the Church each speaking of the Christmas story from Matthew and Luke as a story of love, as a time of remembrance, gratitude and of forgiveness, where we should seek the Christ and offer our gifts to him. As you watch the video try to focus on those things that stand out for you in your mind and in your heart. There are a number of topics that strike a chord with me from that video segment. What is the meaning and significance of this declaration? For the Jewish people awaiting their Jewish Messiah this declaration might have come as a shock. Clearly the angel Gabriel declares this is good news for all people, not just the chosen people. The hills of Bethlehem were used to pasture the temple flocks. Every day, once at the beginning of the day and once at the end of the day the priest would offer a sacrificial lamb on the altar of the temple, a lamb without blemish. It is most likely that these shepherds were entrusted with safeguarding the ewes and the lambs of the temple flock. These were holy shepherds and a holy flock. When the heavenly hosts praise God it is recorded that together they declared "Glory to God in the highest, and on earth peace, good will toward men". Why? As people who purport to follow Christ do we consistently feel peace in our lives and good will to others or are we more often stressed, inviting drama into our lives and pointing condemning fingers at others? What did the people think they needed saving from? The people were looking for a mortal messiah, a warrior, a king to free them from the yoke of subjugation. Remember they have been ruled by the Babylonians, the Persians, the Greeks and now the Romans. After 400-500 years of this physical rule over them the people were focused on saving their land rather than their souls. They wanted a king who would fight their rulers and drive them away. Matthew and Luke both seem to emphasize 3 necessary traits that point to the true Saviour. In announcing these three things to the shepherds, Gabriel is declaring fulfillment of prophecy (Luke 2:11). The shepherds were told in verse 12 that the babe would be lying in a manger and that would be a sign to them. Presumably one of the reasons for them needing a sign is to identify the baby who probably looked like any other baby in Bethlehem. But what other sign might Gabriel be pointing to? Sign of the complete condescension of God (God, creator of all born as a mere mortal and laid in the feeding trough of a sheep), sign of the sacrament ( the Great Shepherd himself laid down symbolically as food for the sheep) might be possible answers. Just another day in the temple. 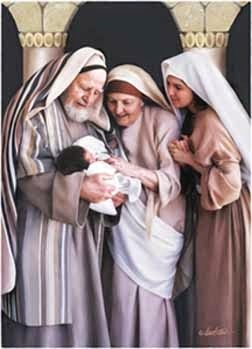 Luke 2:25-26 What if Simeon after his many righteous and devout years just got tired and decided not to go to the temple that day? Do we ever feel tired? Do we ever feel like we earned the right to stop listening to the Lord for a day or two? Maybe this week I wont go to church. I've been good. He wont mind. It's only one week. What if Simeon had said the same thing that day? But he didn't and as a result we get to hear about one of the most personal and patient testimonies in scripture. v.27 "He came by the Spirit into the temple". v.29-32 Simeon was obviously aware the Saviour would be a saviour for all mankind not just the chosen people. v.36-37 Anna was married 7 years and a widow for 84 years. Logic suggests she was over 100 yrs old on this day in the temple. She never left the temple and fasted and prayed. These two elderly examples of righteous waiting and patient living, not only got their reward but became one of the original witnesses of the Saviour's birth. They represent all those righteous who patiently await in faith the coming of the Saviour. I love these passages. They symbolize the reward that awaits us all if we do what is right. This video is the classical song "Nunc dimittis". It is the Latin for the first two words of Simeon's wonderful testimony in Luke 2:29 "Now lettest thou thy servant depart in peace...". Here is the culmination of his life's faith. 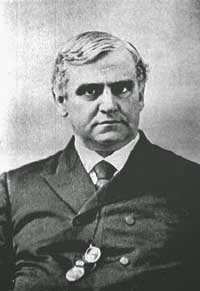 Philip Brooks was an Episcopal clergyman of the mid-1800's who became the Bishop of Massachusetts. He remained unmarried throughout his life and was seen as a pillar of virtue and man of humility by those that knew him despite his 6'4" frame. He originally wanted to be a teacher but at age 20 was fired and declared "I wish I were 15 yrs old again. I believe I might become a stunning man: but somehow or other I do not seem in the way to come to much now". I wonder how many others may have felt that way at some point in their lives. When he died at just age 58 in Boston, one observer of his funeral noted, "They buried him like a king. Harvard students carried his body on their shoulders. All barriers of denominations were down. Roman Catholics and Unitarians felt that a great man had fallen in Israel." At one point in his life he visited the Holy Land and was inspired by the view of Bethlehem from the hills of Palestine. It was there he wrote the lyrics to "O Little Town of Bethlehem". "How silently, how silently, the wondrous gift is given! So God imparts to human hearts the blessing of his heaven. No ear may hear his coming but in this world of sin, where meek souls will receive him still, the dear Lord enters in"
These people we discussed today heard the whisperings of the Spirit in their life and were blessed to witness miraculous events. These special witnesses were only a few when compared to the rest of the world who continued to live their lives unaware of these great events. Most in Bethlehem were unaware of the significance of the babe born among them. Most did not see the star or the angel Gabriel or witness the heavenly host. Most in the temple that day probably had no idea what the fuss of two old people was over the little child. "How silently how silently the wondrous gift is given". Most were not looking for him, they were not listening. And yet silently, wondrously the gift is there for all who will receive it. We all know the story of the wise men recorded in Matthew, that came from the east looking for the babe that was born King of the Jews. And we all know they gave gifts of gold, frankincense and myrhh. But why did they give these gifts? Why not a child's play toy, or some clothes, maybe some cookies (ancient home-baked cookies of course)? The reason is again symbolism. Gold denoted his earthly right to be king as a descendant of David. Frankincense was used in priestly duties in the temple, in burnt offerings and in oil for anointing priests and is symbolic of his pre-ordination as the Anointed One, the Messiah, the Great High Priest. Myrrh represented his partaking of the bitter cup, the atonement, and his breaking of the bitter bands of death that only one of divine birth could do. 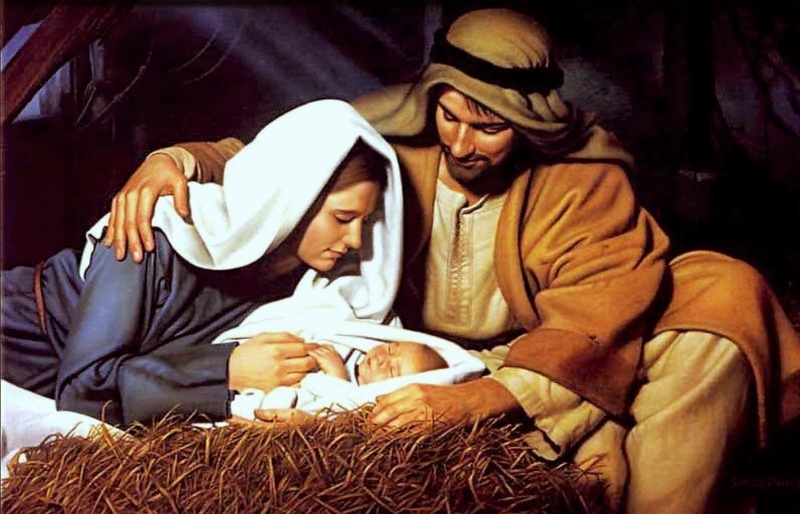 The wise men gave wise gifts recognizing the infant child as King, Messiah and Son of God. What gifts are we asked to give to Christ? A broken heart and a contrite spirit, service, gratitude might all be appropriate answers. The scriptures give no indication how many wise men there were and there is also no indication from scripture that these men were royalty as has been suggested in popular modern Christian lyrics and literature. Notice the reactions of these witnesses. The shepherds "came with haste", and then "made known abroad the saying which was told them concerning this child". Anna came "in that instant" and then "spake of him to all them that looked for redemption". And the wise men studied the stars and then, when they saw the sign of the star, traveled long distances and for at least many months to worship him. awoke with the morning light...He learned to speak, to read, to write; he memorized passages of scripture, and he pondered their deep and hidden meanings. 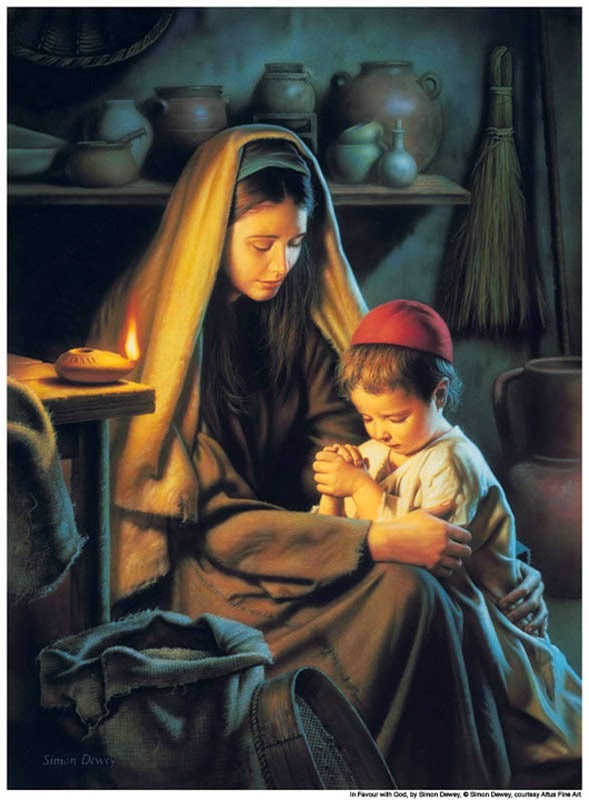 He was taught in the home by Mary, and then by Joseph, as was the custom of the day. Jewish traditions and the provisions of the Torah were discussed daily in his presence. He learned the Schema, reverenced the Mezuzah, and participated in prayers, morning, noon, and night. Beginning at five or six he went to school, and certainly continued to do so until he became a son of the law at twelve years of age...It is also apparent that Jesus learned much from nature--from observing the lilies of the field, the birds of the air, and the foxes that have holes for homes...Further: in his study, and in the learning process, he was guided from on high in a way that none other has ever been." (Bruce R, McConkie:The Mortal Messiah: 1:368-369). The young boy was schooled by diligent, ponderous parents who were loving and obedient to the Lord. But he was also schooled by the Spirit and presumably other angelic instructors and his Father himself. If you ever want a template of how to bring up a young man you won't find any better than Luke 2:52. I have often thought every LDS home and every young men's program in the church should be built on these four pillars. That is a very complete upbringing. Wisdom is not just education and learning but application and understanding of that knowledge. In favour with man is social skills and abilities, awareness and empathy. We do not have much information on Christ as a boy or a young man but it is clear he had a complete upbringing with care and guidance from both his earthly and his divine parents. We would not be wrong to strive for the same balance in raising our own children, and in our own lives! I would like to show the video clip you used above for my Gospel Doctrine class this Sunday and can't download it from here. I was wondering if you could tell me where you got this and how I can download it. I loved seeing the testimony of Pres. Eyring, Pres. Uchtdorf and Pres. Monson. Very powerful. I love your lessons as well. Thank you so much. I have included the link below to the video. Just cut and paste it into your address bar. You can download it from that page. I agree, its a powerful testimony from the First Presidency. If you have further insights from your lessons I'd love to hear about them. Thank you so much for your kind words.